Airtopia is an Australian developed airconditioing controller for infra red based HVAC systems such as split and Cassette systems. 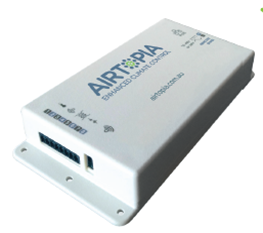 Simple but powerful, Airtopia is a breeze to set up and get running, simply pointing your existing remote at the Airtopia on first operation and it will search its online database in the cloud for the correct Infrared code set to suit your Airconditioner. It will then load it into the hardware. It's that simple to get going. Split infrared controlled HVAC systems are quite common in Australia and New Zealand. The issue with these systems is that control is only one way, without any feedback what so ever. Furthermore each IR string contains code information about the mode, fan speed and set point within in. Given this you must learn every single combination of IR code to get full integration into your home automation system. 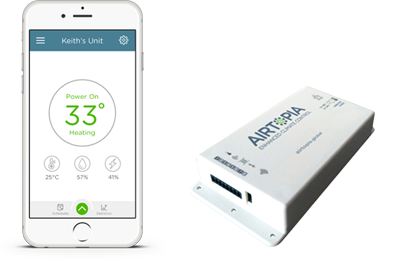 Airtopia utilises a room temperature sensor, current transformer and IR blaster to provide total control over what would normally be a way one system. Airtopia is easy to set up. Simply point your remote at the Airtopia and press a button. Airtopia will then search its online cloud database for the correct code set and load it into the hardware. Quick and simple. Airtopia are a C-Bus enabled partner and the Airtopia IR_Z02 device has a C-Bus interface to link into our C-Bus home automation system allowing control of IR remote controlled AirConditioning systems from any C-Bus touchscreen, eDLT or DLT switch, and iphone, ipad, android device via either Wiser 2's GUI or the native Airtopia cloud based app. Heat, Cool, Fan, Dehumidify & Auto HVAC modes supported. Low, Medium, High or Auto Fan modes supported. 14 – 34 degrees of temperature Set Point supported. Energy usage and power state feedback to C-Bus via the optional (though recommended) Clipsal CT transformer. Ability to send special mode commands like powerful, quiet, economical, horizontal & vertical swing modes. Two way feedback with C-Bus system. 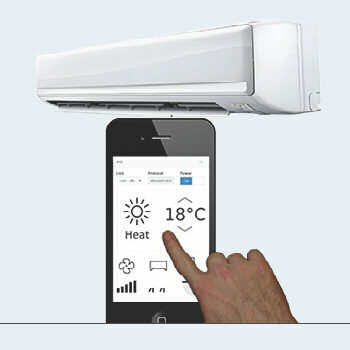 Control the aircon unit from the Airtopia cloud or smart phone application and C-Bus will get feedback. A standalone Smartphone version of this product supporting both iPhones and Android smartphones is great for DIY Smart Home builders. See related products below for details. Airtopia is designed to work with every brand of IR operated heating, ventilation and air conditioning system, and almost every automation system.